This ultra trendy dispenser offers a flexible green push-tab and releases 2,400+ pumps of product! Our system includes a unique green presser button and can be mounted on any wall surface with the hardware provided or with the “sticker” adhesive option. Thymol is a powerful essential oil that helps to naturally remove gram positive bacteria, fungi and other germs that can cause us harm. 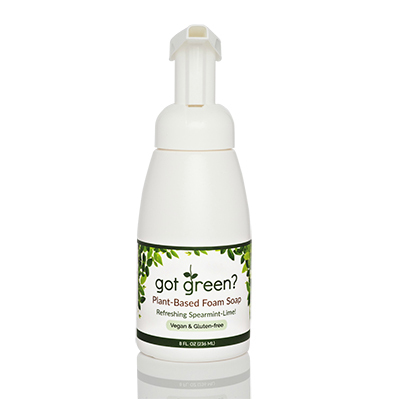 This foam formula has the bonus of being utilized as hand soap OR a natural leave-on sanitizer. Got Green’s unscented foam soap contains a luxurious blend of organic oils that leaves the hands feeling incredibly soft and clean! This formula not only cleans the hands, but the organic shea butter keeps the skin soft all winter long! Our specially crafted blend is safe for the the skin. Push the Green to “Get Green”: Feel the incredible transformation of what plant-based soap can do for your skin, body and mind. 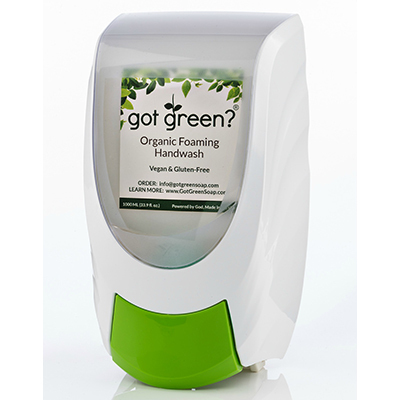 Our super-soft, foam soap containing organic shea butter is just what your company bathroom or business needs! 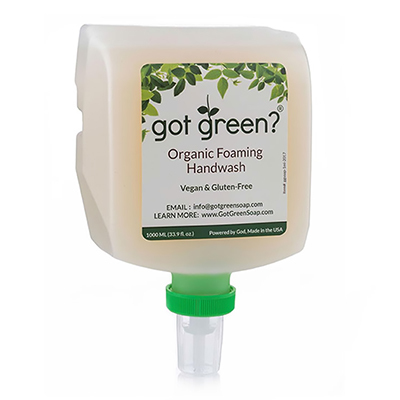 “Got Green?” foam soap also contains the active ingredient: thymol essential oil, to naturally ward off germs and bacteria.